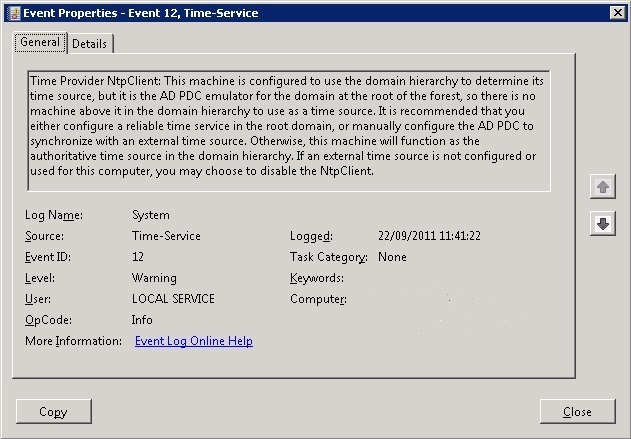 This is due to the fact that the new server hosting the PDC Emulator role is still set to sync time from another Domain Controller within your domain (i.e. through Domain Hierachy). The PDC emulator should be set to sync time with a highly reliable external time source, as it acts as the authoritative time source for your domain. This helps to ensure that time synchronisation between the servers and computers in your network is always accurate. In order to resolve this event there are two steps. The first is to set the new PDC emulator to sync time with an external time source. The are many time (NTP) servers available on the Internet. The NTP Pool Project is an excellent service which provides as accurate time service for all geographical areas. Notice that in the /manualpeerlist part of the command the time.windows.com and 0.ntp.pool.org servers have been specified. Please choose whichever external time source you prefer to use.